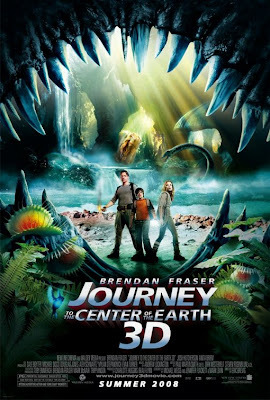 Yesterday we took the kids, all the kids - including 2-year-old Jackson monster, to see this new movie "Journey to the Center of the Earth 3D". I did not realize it was 3D till we got there, but that was a pleasant surprise. Brenden Fraser was at his sci-fi goofy best as usual. And his side kick nephew, the one from icarly and Firehouse Dog, did a decent acting job as well. Trevor, Logan and Lizzie sat mesmerized the whole time. There were some cool 3D parts that made us all jump - we liked that. My favorite funny was when the 35-year-old and the 13-year-old both called dibbs on the cute girl. Can a 13-year-old call dibbs on an adult? Anyway... Jackson actually held up pretty well. He bugged the kids in front of us for awhile (that's ok because they were his cousins) and sat on our laps for the rest of it. It was a fun entertaining show - kids 4 and older will eat it up. We give it 3 bio-luminescent birds out of 5. Thank you for the "review" of the movie. I've been thinking of taking the kids to this movie but didn't really know anything about it. I didn't know it was 3D either. It sounds like it would be a fun movie to take the kids to.